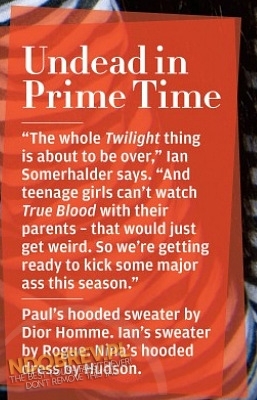 TVD in Rolling Stone,2011 Scans. . Wallpaper and background images in the Maonyesho ya Televisheni ya Vampire Diaries club tagged: the vampire diaries ian somerhalder nina dobrev paul wesley rolling stone scans interview 2011. This Maonyesho ya Televisheni ya Vampire Diaries photo might contain ishara, bango, maandishi, ubao, matini, and ubao wa chokaa.